Good things come to fans who listen to The Odyssey ScoopCast! 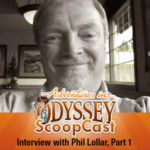 Today you’re in for a special treat as Phil Lollar steps into our studio (well, a virtual one at that) and shares his adventures in Odyssey. The Odyssey ScoopCast brings Adventures in Odyssey co-creator Phil Lollar back for another Odyssey discussion. Phil recalls his transition back to working on the Odyssey team and writing new episodes for a modern AIO. Plus, Phil describes the challenge of writing for the show’s central character, John Avery Whittaker. It’s the first part of a podcast series you won’t want to miss!